The Fuel Cell Interface is unique in that no other product has the ability to allow a reversible PEM fuel cell to be electrolyzed then discharged into a load at the push of a button. Plots Electrolysis and Fuel Cell modes. Experiments include water decomposition, efficiencies and more. Uses any reversible PEM fuel cell from h-tec, Heliocentris or Horizon Fuel Cell Technologies. Can be used with fuel cell stacks like those from Parker. The Fuel Cell Interface operates in two modes--Electrolyzer Mode and Fuel Cell Mode. An external power source like a solar panel, 3 volt battery or DC power supply provides power directly to the reversible PEM fuel cell in order to decompose water into hydrogen and oxygen. The Electrolyzer Mode is entered by pushing and holding the red button in the center of the circuit board. Here, all the energy from the power source is directed into the reversible PEM fuel cell and the normal load is switched out - the reversible PEM fuel cell becomes the load. The left part of the plot shows how the reversible PEM fuel cell behaves in Electrolyzer Mode. the reversible PEM fuel cell, itself, becomes the power source that delivers voltage, current and power into the attached resistive load. The Fuel Cell Mode is entered by default by not pushing on the red button. The right part of the curve is an example of Fuel Cell Mode. Because reversible PEM fuel cells are closely related to the science of chemistry, the experiments will necessarily include references to chemical reactions (including formulas) that occur within the reversible PEM fuel cell, which support the two modes just described. 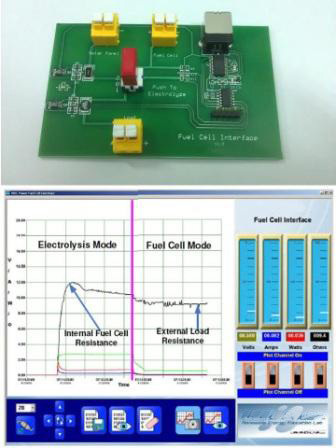 The experiments demonstrate how a reversible PEM fuel cell and reversible PEM fuel cell stacks can be evaluated in terms of understanding electrical characteristics, electrolyzing water and determining efficiencies. The circuit board can accommodate reversible PEM fuel cell voltages up to 10 volts DC and currents up to 1 amp. Plus, the reversible PEM fuel cell’s internal resistance is part of the graphic display – something that no similar measurement product can match. In the Fuel Cell Interface you have a professional measurement instrument that is suitable for a serious study of fuel cells. Consider these experiments as just a basis for your own, expanded applications.